Lumiere, the UK's largest light festival returns to Durham later this week, for a fifth time, lighting up the historic city's skies from Thursday16 - Sunday 19 November. Organised by Artichoke and Durham County Council the free biennial festival brings some of the world's most innovative artists and light designers together in a breath-taking and spectacular programme of artworks across four dazzling winter nights in the north east of England. I am really lucky to have worked at the Lumiere Durham festival on three previous occasions. I have taken journalists around the festival on press trips, hosted tours, PR'd the festival with regional and national media, accompanied photographers on preview nights, monitored social media all of which has been brilliant. But this year I am really looking forward to taking the family simply as a festival goer and thoroughly intend to enjoy it. 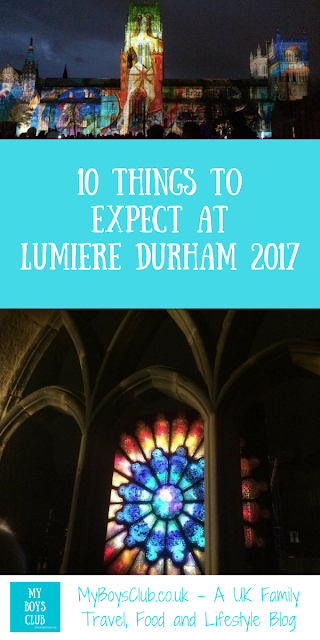 So from my own personal experience here are 10 things to expect at Lumiere Durham, to help you survive and enjoy the amazing festival. Back in Durham for the fifth time, artists from around the world will illuminate the city in delightful and unexpected ways, with a series of light installations to explore. Right across the city, and not just in the centre visitors and residents of Durham will find 28 amazing light installations. My favourites in recent years have included the stick men, dancing to Working in a coal mine on The former Durham Miners Hall., Get Crawling on the viaduct where projected images made it look like people were actually climbing up - this one was mesmerising, and 'Fool's Paradise' projected onto the facade of Durham Castle. There as also been 'Litre of Light' in the Durham Cathedral Cloisters; a 3D whale animation on the River Wear; a bridge that miraculously turned into a waterfall; a souvenir snowdome that is engulfed one of the city's most famous statues, sea glass waves, a telephone fishtank and and of course Ross Ashton's Crown of Light which turned Durham Cathedral's north face into a huge canvas, covered with images of the Lindisfarne Gospels. Can't wait to see whats in store this year! 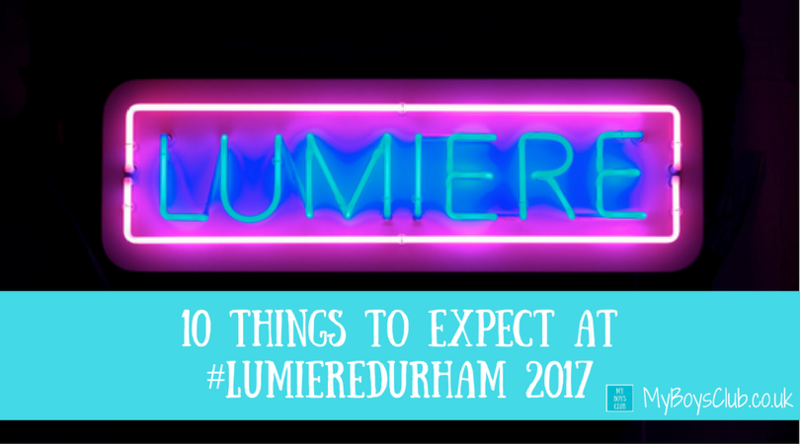 The full list can be found on the Lumiere Durham website. Two years ago the event attracted over 175,000 people over the four days of the festival. Durham is a compact and small city so it is going to be busy. So be prepared to queue even if you have a ticket, or if you visit after 7.30pm, as numbers in the central festival area will be managed to offer everyone the best possible experience. It is going to be crowded but just follow the directions of the Festival Makers and Stewards and police and you'll have a great time. You can buy a programme which includes installation information and a handy map for £2. You can also download a map from the Lumiere Durham website. Durham has lots of places where you can get refreshments from the permanent restaurants and cafes to temporary stalls for the festival. Book ahead if you are wanting to have a full dining experience and take snacks with you too. Check our the Durham BID and This Is Durham websites for more details on where to eat in the city. Inside the festival guide, you’ll also find a temporary InDurham Loyalty Card in there for you to use while you’re in the City. It gives you access to exclusive deals, discounts and offers at participating businesses over the course of the festival! Its a great festival for children. Do take into consideration that it is dark and cold, but they will love the installations. My boys never hesitate to say yes when we plan to go. In the past, I've seen people really struggling with buggies and pushchairs though. These are really difficult to get through the crowds with. So if you can, carry your child in a baby carrier or a sling so they can enjoy all the installations with you. The city's main street lights are switched off or dimmed so the full effect of Lumiere can be experienced. However, this does make it harder underfoot, especially if you are not used to walking around the cobbled streets of Durham, and getting around Durham can be challenging at any time. Pop a torch in your pocket for any really dark areas. It will make all the difference. I have been to Lumiere in torrential rain, freezing temperatures, and gusty, windy conditions. It is November, just remember that and dress accordingly. I'll definitely be taking my hat scarf and gloves, walking boots and a winter waterproof coat. Just don't bring a brolly. Lumiere is a large scale event in a small city. There is going to be road closures and there will be traffic congestion so if you can travel by public transport. The bus and rail stations are just a short walk from the city centre. Extra bus services for Lumiere are being provided from a variety of locations across the North East. The best option if you're coming to Lumiere by car is to head to one of the Park and Ride sites. An enhanced service is operating right through the festival which includes three extra sites, extended opening times and frequent buses to and from the city, these will be able to take over 3000 cars and drop you right at the heart of the festival. There will also be temporary taxi ranks in two places in the city during the festival on Sutton Street and Old Elvet. A free ticketing system will be in operation during peak times between 4.30pm and 7.30pm for the city centre peninsula area only. All tickets are now gone but did you know, 18 of the 28 artworks are located outside the ticketed area. So don't let it put you off that you haven't got a ticket. You'll find exciting artworks in all sorts of places away from the centre; from St Oswald's Church and the Miners' Hall at Redhills to Crown Court Gardens and Durham University's Science Site at Lower Mountjoy and Botanic Gardens. These can be visited at any time without a ticket. So take a detour. If you don't have a ticket, enjoy the outer areas first, and come into the centre after 7.30pm. 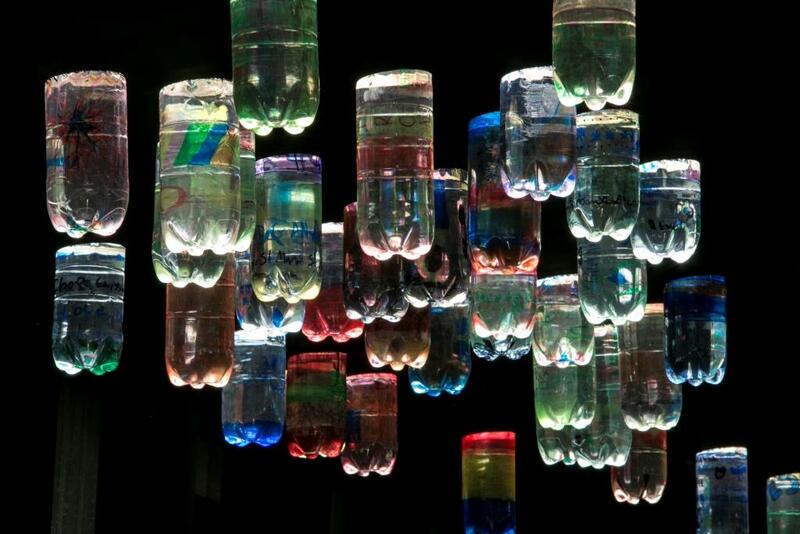 In past years we have seen empty pop bottle turned into lights; bicycles lighting up stained glass windows in cars. The science behind the installations never fails to amaze my boys. I wonder what we'll see this year? Guide dogs are welcome at Lumiere but due to the number of people expected to attend it is unsuitable for family pets. Make sure you follow the ‪#‎LumiereDurham‬ hashtag - as organisers will be tweeting live across the event to give you the latest traffic, travel and parking news. 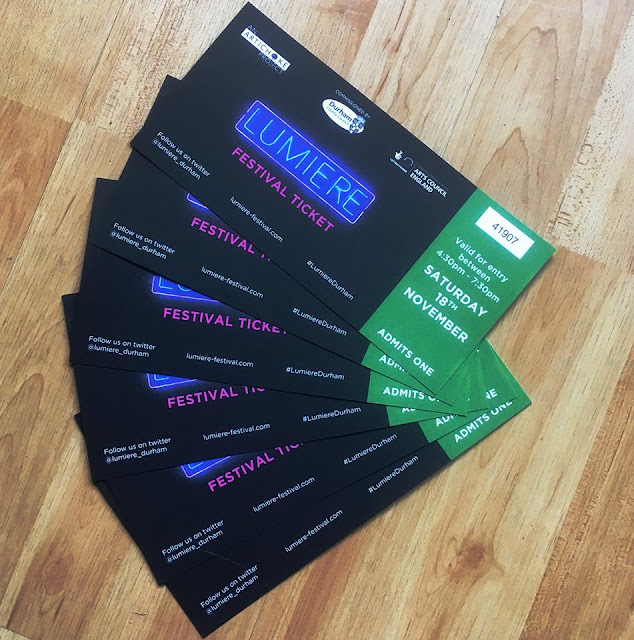 Have you been to Lumiere? What tips would you give people who haven't been before? All photos are my own unless stated otherwise. To be kept up to date with events, new openings, recipes, things to do and child-friendly places to take the kids, plus giveaways then follow My Boys Club on Facebook, Instagram or Twitter too. Or why not pin this post on Pinterest? A Lifestyle - Food - Travel Blog all about enjoying life with my family of boys in North East England and beyond. We cover cultural events, family days out, and eating out in Newcastle, Northumberland, Tyne and Wear, Durham, Teesside, as well as travel, short-breaks and holidays further afield. We have recipes to cook at home and review books, toys and games too, and every month we list all of the free family events and activities happening across North East England. 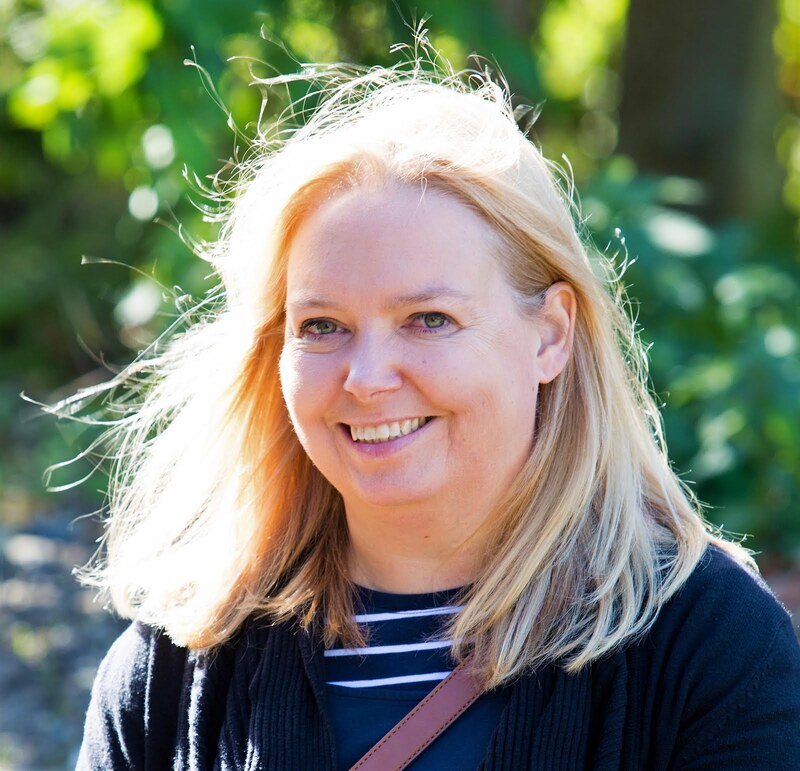 My Boys Club - a lifestyle, food and travel blog by Deb Sharratt all about enjoying life in a family of boys in North East England and beyond. © DebSharratt and MyBoysClub.co.uk, 2019. Unauthorized use and/or duplication of this material without express and written permission from this blog’s author and/or owner is strictly prohibited. Excerpts and links may be used, provided that full and clear credit is given to DebSharratt and MyBoysClub.co.uk with appropriate and specific direction to the original content.